Do you see this much??? 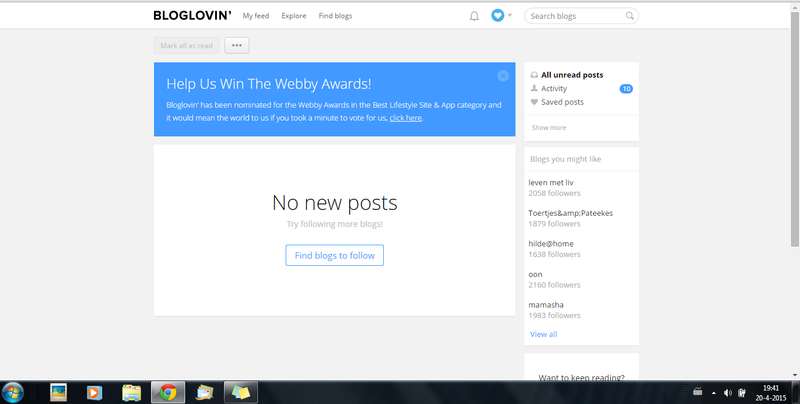 I love reading and looking on blogs, but in all the years I found to many blogs I like, and my bloglovin is still growing. So from time to time, I love seeing this, also when it's just for 5 minutes..
Well, for now it's already a hour the same.. hihi.. But not for long I think. 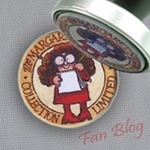 So write some lovely post, the evening is still young, enough time to read. 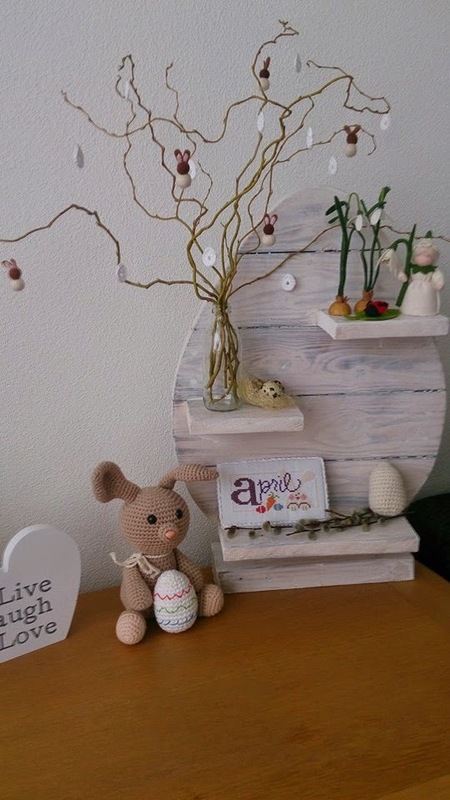 In this Easter piece I put the same bunny's, and also made a felted doll, a little one, In the collage you see it better, it's holding a dallodil in his hands. so sweet. 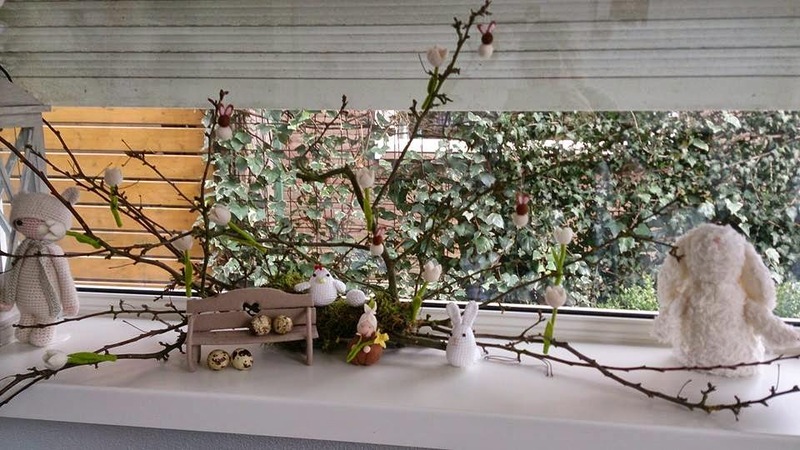 Kids always have there own easter tree on the diner table, they worked hard to fill it!! Now it's all back in boxes. Tulips are really Dutch, I found a lovely pattern, to put it in a cover. In there need to come also Tulips, still working on them.. Yesterday we had a communion of a nephew. The very first time I saw one ( and more will follow) lovely too see it all. I'm not religion, but my in-laws are Catholic. It's also a fun way of seeing the family. Next year my God-child will do his Communion, and then more nephew's and nieces will follow. The only thing I know about a communion is that kids are always so beautifull dressed, so I found it a good reason to put my sewing machine one the table again ( really have to do it more often). For Kira a dress white with red polka-dots.. only the fabric is super cute!! Made a red bolero for on it. I found some cute white balet flat's ( her first one's, I always walk on those in the summer), with socks that have a lace. Under a dress like that in my mind girls always have socks with lace.. hihi and I found them. In her hair 2 lovely braids with red ribbon. For Noah I had such lovely clothing in his closet, but I wanted to make also something for him. So made again a pattern for a gilet. This looks so simple but when you sew it wrong you hear a lot of *^%%*#E$@&#$W&ET..... I needed to cute it smaller, It just fit him, and he loved it so much. Noah is a boy who can wear a tie every day, he just loves it. I also found some lovely cheap neat shoes for him. But the kids looked so pretty, and where so sweet. Best kids of the world!!! 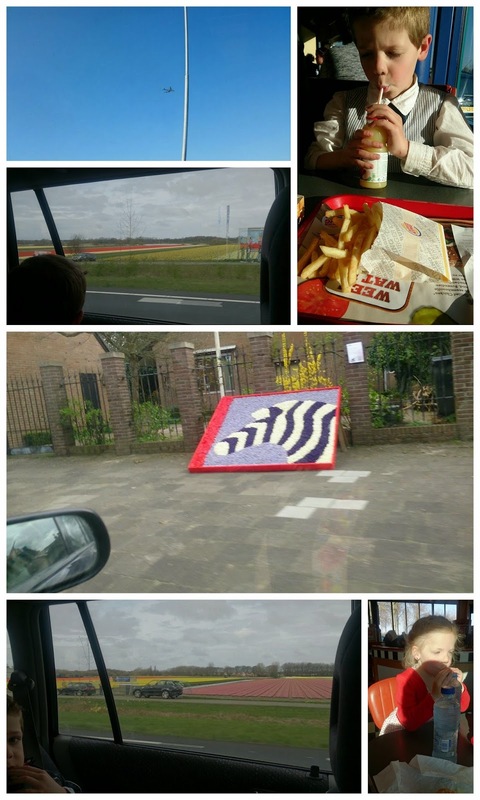 It was a drive of almost 2 hours and also back, we saw so many beautifull things. Keukenhof ( a Spring flower parc, still love to go there one day) is very famous in the Netherlands, we where near that, so many flowers we saw. On the way home we went near by Schiphol, our biggest airport. And special for hubby and the kids, at the end we went to BurgerKing for some French fries and Burgers. I still have more things to show but that's for a another post. I finally also finsihed this Shrug/vest this weekend, but haven't made pic's. Tomorrow it will be 19 degrees, so I can wear it and will take pictures of it also on me.. 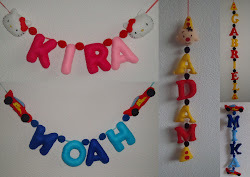 Need to think which clothing I will crochet now.. I love having a simple project..
My daughter's school uniform requires wearing white shoes daily. No matter how much you clean, it turns dirty daily. Once in a while, I have to wash them but they are so big and heavy that they take lot of time to dry. 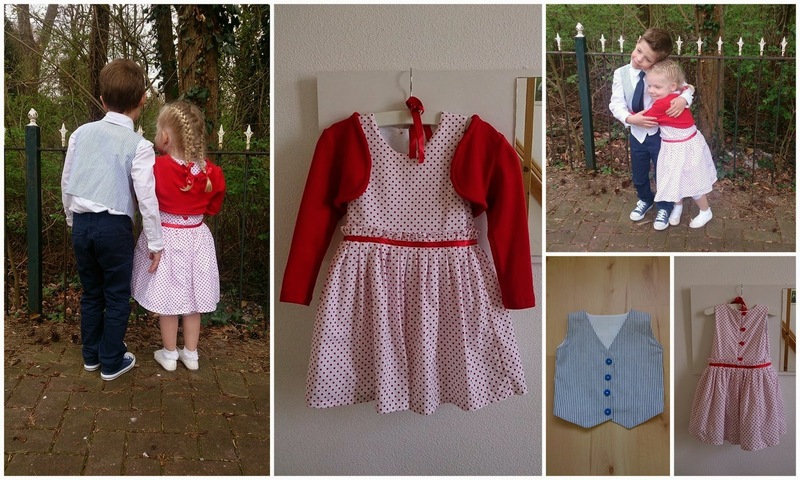 Lovely clothes for your children, they look ever so smart.. perfect for the family day celebrating a communion! Wat een mooie kleding genaaid. Vooral dat stippen jurkje. Leuk al die paasstukjes. En ik volg ook heel veel blogjes. Zo leuk om allemaal te lezen. Hello Annette ! 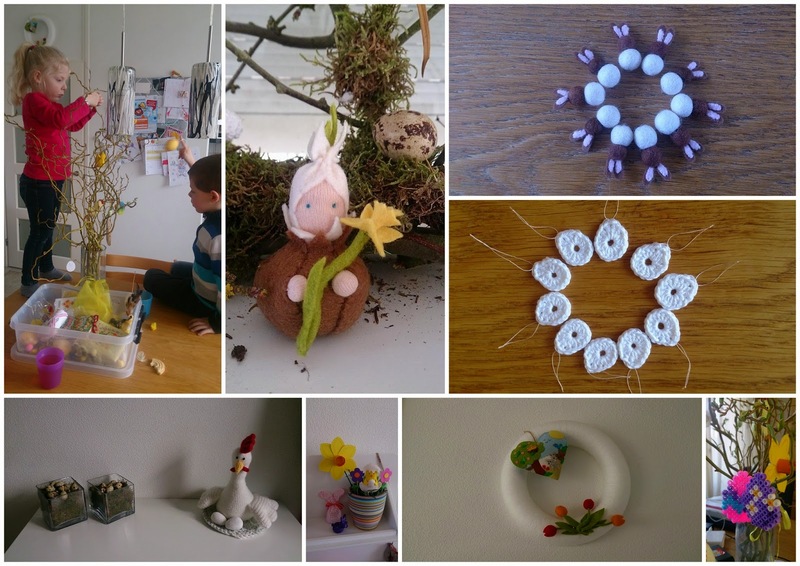 Yourester decorations were all lovely and the big wooden egg is a real treasure.Oh, how I admre your crochetings skils-You are so versatile crafter..Enjoy the spring and the coming Kingsday! You've really done a lot of crafting lately. Don't know how you find the time. Those kids are looking so grown up these days. Such cute outfits! It's nice to see a brother and sister enjoying each other's company! So many lovelies as always. Kids look so cute in their clothes :D great work!!! 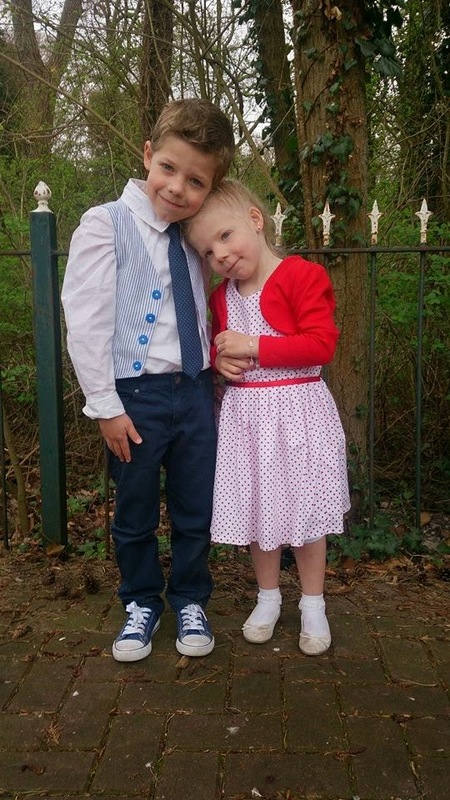 Aww... that photo of Noah and Kira in those beautiful outfits is so adorable, Annette!! How do you ever find the time to make clothes along with your crafting? Do you ever sleep--ha ha! !